The study of past climates has practical relevance to today, helping to understand present impacts on climate, such as global warming or rising carbon dioxide levels. However, paleoclimatology also addresses the inner desire of human beings—who seek after truth, beauty, and goodness—to comprehend aspects of the biotic and abiotic environment, present and past, regardless of any obvious practical impact to human life. Scientists employ a number of tools and concepts to study past climates and climate changes. These tools include sediment cores, ocean cores, ice cores, geologic features and stratigraphy, cave deposits (speleothems), tree rings (dendrochronology), and fossil coral. Each of these different tools contains useful proxies, which provide clues about different aspects of past climates. Oxygen isotopes preserved in the skeletons of dead organisms (foraminifera) located in sediment cores drawn from ocean and lake bottoms provide information on past temperatures; gas bubbles trapped in ice cores provide information on past atmospheric conditions; and dust and volcanic ash content provide information on atmospheric circulation patterns, climate, and volcanic activity. Terrestrial sediment records from peatlands and lakes are studied for pollen and plant macrofossil content and dated using radiocarbon methodology. Tree rings are analyzed for indications of stress related to drought or tectonic activity and fossil corals are analyzed for their isotopic changes. A number of factors influence earth's climate and climate change through time, including changes in the earth's orbit and position with respect to the sun, continental drift, mountain building, and volcanic activity. More recently, the burning of fossil fuels has been implicated in anthropogenic climate change. 4.2 Was the Younger Dryas global? Paleoclimatology relies on a number of geologic concepts, including the idea that sediment layers are deposited chronologically, with the oldest layers occurring at the bottom, and uniformitarianism, that the present is the key to the past. Dating techniques support the idea that layers are deposited chronologically. Geologists analyze stratigraphic layers in sedimentary rock, with each layer representing millions to hundreds of millions of years. The geologists look for clues in not only rock composition and texture, but also changes in organisms preserved as fossils. Red sedimentary rocks, laid down up to 2.5 billion years ago, indicate the first occurrences of oxygen in the atmosphere, deduced from oxidation of the iron-rich sediments. Though the early earth had no signs of life, it is thought that between 1.8 and 2.5 billion years ago (the Proterozoic), blue-green algae began to emerge in the oceans, gradually increasing the amount of oxygen in the atmosphere. At first, this oxygen was consumed immediately, but then gradually began to build up in the atmosphere, and that weathering of the iron-rich rocks allowed for iron oxidation, turning these layers of sediment red. After oxygen built up in the oceans, it eventually became toxic to the blue-green algae, causing a die-off of the organisms, and leading to the deposition of dark, unoxidized layers. As the blue-green algae eventually re-established itself, atmospheric oxygen levels began to rise again. This is thought to be the reason for the banding in the banded iron formations (BIFs). Radiogenic dating of these rocks allows geologists to constrain the timing of climatic change. Currently, the only ice sheets are found on Antarctica and Greenland. As snow falls on these ice sheets, it compacts with time, forming distinct depositional layers with each consecutive season of snow accumulation. These layers contain tiny bubbles of gas that hold information about atmospheric conditions at the time the bubbles were last in contact with the surface. The Greenland GRIP and GISP2 ice cores and the Antarctica Vostok record have been correlated to each other up to 100,000 years (Bender et al. 2002), but one Antarctic record goes back 740,000 years (Augustin et al. 2004). Methane, carbon dioxide, and other atmospheric properties are extracted from the gas bubbles, then analyzed and dated by counting stratigraphic layers. Volcanic ash layers deposited in the ice cores can be cross correlated to other records based on composition and thickness as a means of constraining the dates. Dust in ice cores provides additional information about climate. During glacial periods, it is thought that climate was drier and windier because of abundant dust layers during these periods. Inside of these layers, scientists have found pollen, allowing them to estimate the total amount of plant growth of that year by the pollen count. The thickness of the layer can help to determine the amount of rainfall that year. Various proxies in ocean cores provide information about climate cooling or warming as well as changes in ocean circulation patterns. Microscopic organisms called foraminifera form calcareous shells, which then fall to the ocean floor when they die. The isotopic composition of these shells reflects the isotopic composition at that time. 13C/12C ratios are used as paleo-ocean circulation change tracers and oxygen isotope changes reflect sea surface temperature changes. Three isotopes of oxygen exist, O-16, O-17, and O-18. O-18 is two neutrons heavier than O-16, meaning that it takes more energy for it to be incorporated into molecules than O-16. A warmer water temperature means that the molecules require less energy to vaporize, as they already have more energy. A cooler water temperature means that the water requires more energy to vaporize. As a heavier O-18 water molecule requires more energy than an O-16 water molecule to depart from the liquid state, cooler water releases vapor that is higher in O-16 content. Cooler air likewise precipitates more O-18 than warmer air. Cooler water, therefore, collects more O-18 relative to O-16 than does warmer water. Knowing the amount of O-16 and O-18 in a sample provides information on the temperature at the time the gas was trapped. Characteristics of preserved vegetation (plant macrofossils), insects, or pollen, and isotope ratios provide information about climate change in sediment records from lakes and peatlands. As climate shifts occur, so do changes in species composition. Identifying the species of pollen and plant remains indicates the nature of these changes and the rate of these changes. Radiocarbon dating of plant remains can accurately show when these changes occurred in earth's history. Most of the research of this kind deals with climate change during the late Pleistocene and Quaternary periods. Dendrochronology is the analysis of tree ring growth patterns. Because most trees grow one ring a year, dendrochronology can produce an accurate calendar age. By analyzing these rings for width and maximum latewood density, factors like precipitation, temperature, and other stress patterns can be identified (also called dendroclimatology). In order to get longer chronologies, the method of cross-dating is used, where width of rings are visually compared to one another in trees of different ages. If a time period of growth overlaps in the two records, then the tree-ring record can be extended farther back in time. For example, the record extends back more than 10,000 years for river oak trees from southern Germany. Dendrochronology is also used as a calibration tool for radiocarbon dating, since radiocarbon years do not match up with calendar years. 0.00022 Ma to present industrialized world and the introduction of man-made greenhouse gases. The earliest atmosphere of the earth was probably stripped away by solar winds early in the history of the planet. These gases were later replaced by an atmosphere derived from outgassing from the earth. Sometime during the late Archean era, an oxygen atmosphere began to develop from photosynthesizing algae. Free oxygen did not exist until about 1,700 Ma and this can be seen with the development of the red beds and the end of the banded iron formations. This signifies a shift from a reducing atmosphere to an oxidizing atmosphere. The very early atmosphere of the earth is considered to have contained mostly carbon dioxide (CO2)—about 80 percent. This gradually dropped to about 20 percent by 3,500 Ma. This coincides with the development of the first bacteria about 3,500 Ma. By the time of the development of photosynthesis (about 2,700 Ma), CO2 levels in the atmosphere were in the range of 15 percent. During the period from about 2,700 Ma to about 2,000 Ma, photosynthesis dropped the CO2 concentrations from about 15 percent to about 8 percent, and by about 2,000 Ma free O2 was beginning to accumulate. This gradual reduction in CO2 levels continued to about 600 Ma at which point CO2 levels were below 1 percent and O2 levels had risen to more than 15 percent. This time period of 600 Ma corresponds to the end of the Precambrian and the beginning of the Cambrian, the end of the Cryptozoic and the beginning of the Phanerozoic—the beginning of oxygen-breathing life. The Phanerozoic goes from the present back to that earliest period, in which rocks are found, for the first time, numerous large, distinctly fossilizable multicellular organisms that are more complex than sponges or medusoids. A proposed reconstruction of the supercontinent Rodinia 750 million years ago, with 1.1 billion years old orogenic belts highlighted. The climate of the late Precambrian was typically cold with glaciation spreading over much of the earth. 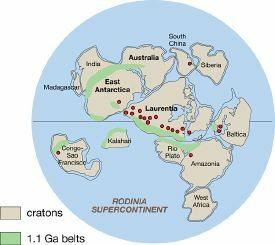 At this time, the continents were bunched up in a supercontinent called Rodinia. Massive deposits of tillites and anomalous isotopic signatures are found that are consistent with the idea that the earth at this time was a massive snowball. During this time it is thought that most of the surface of the planet was covered in ice and a massive die-off of life occurred. As the Proterozoic eon drew to a close, the earth started to warm up. Volcanic activity caused a build up of carbon dioxide in the atmosphere, gradually warming the climate and melting the massive ice sheets. By the dawn of the Cambrian and the Phanerozoic eon, Earth was experiencing average global temperatures of about 22°C. Hundreds of millions of years of ice were replaced with the balmy tropical seas of the Cambrian within which life exploded at a rate never seen before or after (Gould 1990). As noted above, the Phanerozoic eon begins at the time when evidence of numerous large, distinctly fossilizable multicellular organisms that are more complex than sponges or medusoids is found in rocks, and continues to the present. Previous to this was the Precambrian. 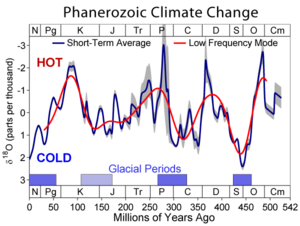 Qualitatively, during the Phanerozoic, the earth's climate was varied between conditions that supported large-scale continental glaciation and those which were extensively tropical, lacking permanent ice caps even at the poles. The timescale for this variation is roughly 140 million years and may be related to earth's motion into and out of galactic spiral arms (Veizer and Shaviv 2003). The difference in global mean temperatures between a fully glacial earth and an ice-free earth is estimated at approximately 10°C, though far larger changes would be observed at high latitudes and smaller ones at low latitudes. One key requirement for the development of large-scale ice sheets is the arrangement of continental land masses at or near the poles. With plate tectonics constantly rearranging the continents, it can also shape long-term climate evolution. However, the presence of land masses at the poles is not sufficient to guarantee glaciations. Evidence exists of past warm periods in Earth's climate when polar land masses similar to Antarctica were home to deciduous forests rather than ice sheets. Changes in the atmosphere may also exert an important influence over climate change. The establishment of CO2-consuming (and oxygen-producing) photosythesizing organisms in the Precambrian led to the production of an atmosphere much like today's, though for most of this period it had a much higher concentration of CO2. Similarly, the earth's average temperature was also frequently higher than at present, though it has been argued that over very long timescales, climate is largely decoupled from carbon dioxide variations (Veizer et al. 2000). Or, more specifically, it is held that changing continental configurations and mountain building probably have a larger impact on climate than carbon dioxide. Others dispute this, and suggest that the variations of temperature in response to carbon dioxide changes have been underestimated (Royer et al. 2004). However, it is clear that the preindustrial atmosphere with only 280 ppm CO2 is not far from the lowest ever occurring since the rise of macroscopic life. Superimposed on the long-term evolution between hot and cold climates have been many short-term fluctuations in climate similar to, and sometimes more severe than, the varying glacial and interglacial states of the present ice age. Some of the most severe fluctuations, such as the Paleocene-Eocene Thermal Maximum, may be related to rapid increases in atmospheric carbon dioxide due to the collapse of natural methane reservoirs in the oceans. Severe climate changes also seem to have occurred during the course of the Cretaceous-Tertiary, Permian-Triassic, and Ordovician-Silurian extinction events; however, it is unclear to what degree these changes caused the extinctions rather than merely responding to other processes that may have been more directly responsible for the extinctions. The Quaternary period covers the last ~2 million years, including the Pleistocene and Holocene. The beginning of this period marks the onset of the glacial and interglacial cycles that began 2.6–1.8 million years ago and lasted until the last deglaciation 18,000 years ago. It is widely accepted that the onset of these glacial cycles are the result of Milankovitch cyclicity, dominated by the 100,000-year eccentricity cycle, interspersed with shorter ten to fifteen thousand year warmer periods. This trend has been particularly pronounced in the last 750,000 years. Ice core data for the past 400,000 years. Note length of glacial cycles averages ~100,000 years. Blue curve is temperature, green curve is CO2, and red curve is windblown glacial dust (loess). Today's date is on the left side of the graph. Note in the graphic on the right, the strong 120,000-year periodicity of the cycles, and the striking asymmetry of the curves. This asymmetry is believed to result from complex interactions of feedback mechanisms. It has been observed that ice ages deepen by progressive steps, but the recovery to interglacial conditions occurs in one big step. The Holocene spans the last 10,000 radiocarbon years (approximately 11,430 ± 130 calendar years). The beginning of the Holocene was punctuated by the Younger Dryas cold period, the final part of the Pleistocene epoch. The end of the Younger Dryas has been dated to about 11,600 calendar years BP (Before Present, or about 9600 B.C.E.). However, evidence for the Younger Dryas is not clear cut anywhere other than in the Northern Hemisphere. The Holocene Climatic Optimum was a period of warming in which the global climate became 0.5–2°C warmer than today. However, the warming was probably not uniform across the world. It began roughly 9,000 years ago and ended about 5,000 years ago, when the earliest human civilizations in Asia were flourishing. This period of warmth ended with a cooler period and minor glaciation, which continued until about 2,000 years ago. By that time, the climate was not unlike today's, but with a slightly warmer period from the tenth to fourteenth centuries known as the Medieval Warm Period. The Little Ice Age, which began in the thirteenth and fourteenth centuries and ended in the mid-nineteenth century was yet another period of cooling, though not as severe as previous periods of cooling during the Holocene. The Holocene warming is really another interglacial period and does not represent a permanent end to the Pleistocene glaciation. It is thought that the planet will return to a new period of glaciation in as little as 3,000 years. However, if the human-induced global warming continues, a super-interglacial might occur, and become warmer and possibly longer than any past interglacial periods in the Pleistocene. A super-interglacial period could become warmer than the Eemian interglacial period, which peaked at roughly 125,000 years ago and was warmer than the Holocene. The Younger Dryas stadial, named after the alpine/tundra wildflower Dryas octopetala, and also referred to as the Big Freeze (Berger 1990), was a brief (approximately 1,300 ± 70 years) cold climate period following the Bölling/Allerød warming at the end of the Pleistocene between approximately 12.7 to 11.5 ky BP, and preceding the Preboreal of the early Holocene. In Ireland, the period has been known as the Nahanagan Stadial, while in the United Kingdom it has been called the Loch Lomond Stadial. The Younger Dryas is also a Blytt-Sernander climate period detected from layers in north European bog peat. It is dated approximately 12,900–11,500 BP calibrated, or 11,000–10,000 BP uncalibrated. An Older Dryas stadial had preceded the Allerød, approximately 1,000 years before the Younger Dryas; it lasted 300 years. The Younger Dryas saw a rapid return to glacial conditions in the higher latitudes of the Northern Hemisphere between roughly 12,900–11,500 years before present (10,900 B.C.E. to 9500 B.C.E.) in sharp contrast to the warming of the preceding interstadial deglaciation. The transitions each occurred over a period of a decade or so (Alley et al. 1993). Thermally fractionated nitrogen and argon isotope data from Greenland ice core GISP2 indicates that the summit of Greenland was ~15°C colder than today during the Younger Dryas (Alley et al. 1993). In the United Kingdom, coleopteran (fossil beetle) evidence suggests mean annual temperature dropped to approximately -5°C (Severinghaus 1998), and periglacial conditions prevailed in lowland areas, while ice fields and glaciers formed in upland areas (Atkinson 1987). Nothing like the size, extent, or rapidity of this period of abrupt climate change has been experienced since (Alley 2000). Answering the question of whether the Younger Dryas is global is hampered by the lack of a precise definition of "younger dryas" in all the records. In western Europe and Greenland, the Younger Dryas is a well-defined synchronous cool period. But cooling in the tropical North Atlantic may have preceded this by a few hundred years; South America shows a less well-defined initiation, but a sharp termination. The "Antarctic cold reversal" appears to have started a thousand years before the Younger Dryas, and has no clearly defined start or end; Huybers has argued that there is fair confidence in the absence of the Younger Dryas in Antarctica, New Zealand and parts of Oceania. Similarly, the Southern Hemisphere cooling known as the Deglaciation Climate Reversal (DCR) began approximately 1 Kya before the YD, between 14 Kya and 11.5 Kya as noted in the Sajama ice core. The Andean climate returned to LGM conditions with colder temperatures coupled with higher precipitation (high lake stands in the altiplano) (Thompson et al. 2000). The prevailing theory holds that the Younger Dryas was caused by a significant reduction or shutdown of the North Atlantic thermohaline circulation in response to a sudden influx of freshwater from Lake Agassiz and deglaciation in North America. The global climate would then have become locked into the new state until freezing removed the freshwater "lid" from the north Atlantic Ocean. This theory does not explain why South America cooled first. Previous glacial terminations probably did not have Younger Dryas-like events, suggesting that whatever the mechanism is, it has a random component. Measurements of oxygen isotopes from the GISP2 ice core suggest the ending of the Younger Dryas took place over just 40–50 years in three discrete steps, each lasting five years. Other proxy data, such as dust concentration, and snow accumulation, suggest an even more rapid transition, requiring a ~7°C warming in just a few years (Alley 2000; Alley et al. 1993; Sissons 1979; Dansgaard 1989). The Younger Dryas is often linked to the adoption of agriculture in the Levant (Bar-Yosef and Belfer-Cohen 2002). It is argued that the cold and dry Younger Dryas lowered the carrying capacity of the area and forced the sedentary Early Natufian population into a more mobile subsistence pattern. Further climatic deterioration is thought to have brought about cereal cultivation. While relative consensus exists regarding the role of the Younger Dryas in the changing subsistence patterns during the Natufian, its connection to the beginning of agriculture at the end of the period is still being debated (Munro 2003). Geologically short-term (c.100,000 years) temperatures are believed to be driven by orbital factors, coined Milankovitch cycles after Serbian astronomer Milutin Milankovitch. Variations in Earth's eccentricity, tilt, and precession vary on time scales of 100,000 years, 41,000 years, and 23,000 years, respectively. The arrangements of land masses on the earth's surface (continental drift) are believed to reinforce these orbital forcing effects. Continental drift affects the thermohaline circulation, global density-driven circulation, which transfers heat between the equatorial regions and the poles, to the deep ocean, and back to the surface through upwelling. The position and extent of polar ice caps also affects thermohaline circulation. The timing of ice ages throughout geologic history is in part controlled by the position of the continental plates on the surface of the earth. When landmasses are concentrated near the polar regions, there is an increased chance for snow and ice to accumulate. Small changes in solar energy can tip the balance between summers in which the winter snow mass completely melts and summers in which the winter snow persists until the following winter. Comparisons of plate tectonic continent reconstructions and paleoclimatic studies show that the Milankovitch cycles have the greatest effect during geologic eras when landmasses have been concentrated in polar regions, as is the case today. Today, Greenland, Antarctica, and the northern portions of Europe, Asia, and North America are situated such that a minor change in solar energy will tip the balance between year-round snow/ice preservation and complete summer melting. The presence of snow and ice is a well-understood positive feedback mechanism for climate. The earth today is considered to be prone to ice age glaciations. Another proposed factor in long-term temperature change is the Uplift-Weathering Hypothesis, first put forward by T. C. Chamberlin in 1899 and later independently proposed in 1988 by Maureen Raymo and colleagues, where upthrusting mountain ranges expose minerals to weathering resulting in their chemical conversion to carbonates, thereby removing CO2 from the atmosphere and cooling the earth. Others have proposed similar effects due to changes in average water table levels and consequent changes in sub-surface biological activity and pH levels. Over the very long term, the energy output of the sun has gradually increased, on the order of 5 percent per billion (109) years, and will continue to do so until it reaches the end of its current phase of stellar evolution. ↑ Holocene and Blytt-Sernander Sequence. Arizona University. Retrieved May 14, 2007. ↑ Climate Change 2001. Intergovernmental Panel on Climate Change. Retrieved May 14, 2007. ↑ Wallace S. Broecker, Was the Younger Dryas Triggered by a Flood? Retrieved May 14, 2007. Alley, R. B. 2000. The Younger Dryas Cold Interval as Viewed From Central Greenland. Quaternary Science Reviews 19:213-226. Alley, R. B., D. A. Meese, A. J. Shuman, A. J. Gow, K. C. Taylor, P. M. Grootes, J. W. C. White, M. Ram, E. D. Waddington, P. A. Mayewski, and G. A. Zielinski. 1993. Abrupt Increase in Greenland Snow Accumulation at the End of the Younger Dryas Event. Nature 362:527-529. Atkinson, T. C. et al. 1987. Seasonal Temperatures in Britain During the Past 22,000 Years, Reconstructed Using Beetle Remains. Nature 325:587-592. Augustin, L. et al. 2004. Eight Glacial Cycles from an Antarctic Ice Core. Nature 429:623-628. Bar-Yosef, O., and A. Belfer-Cohen. 2002. Facing Environmental Crisis. Societal and Cultural Changes at the Transition from the Younger Dryas to the Holocene in the Levant. In The Dawn of Farming in the Near East, edited by R. T. J. Cappers and S. Bottema, 55-66. Berlin: Ex oriente. Bender, M., T. Sowers, M. L. Dickson, J. Orchardo, P. Grootes, P. A. Maywski, and D. A. Meese 2002. Climatic Correlations Between Greenland and Antarctica During the Past 100,000 Years. Nature. 372:663-666. Bradley, R. S. 1985. Quaternary Paleoclimatology: Methods of Paleoclimatic Reconstruction. Allen & Unwin. Dansgaard, W., et al. 1989. The Abrupt Termination of the Younger Dryas Climate Event. Nature 339:532-534. Friedrich, M. et al. 1999. Paleo-environment and Radiocarbon Calibration as Derived from Lateglacial/Early Holocene Tree-ring Chronologies. Quaternary International 61:27-39. Gulliksen, S., et al. 1998. A Calendar Age Estimate of the Younger Dryas–Holocene boundary at Krakenes, Western Norway. Holocene 8(3):249-259. Hughen, K. A., J. R. Southon, S. Lehman, and J. Overpeck. 2000. Synchronous Radiocarbon and Climate Shifts During the Last Deglaciation. Science 290:1951-1954. Imbrie, J., and K. P. Imbrie. 1979. Ice Ages: Solving the Mystery. Enslow. Munro, N. D. 2003. Small Game, the Younger Dryas, and the Transition to Agriculture in the Southern Levant. Mitteilungen der Gesellschaft für Urgeschichte 12:47–64. Royer, D. L., R. A. Berner, I. P. Montañez, N. J. Tabor, and D. J. Beerling. 2004. 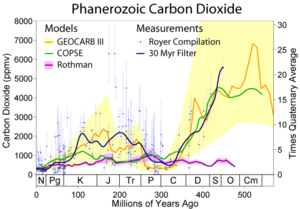 CO2 as a Primary Driver of Phanerozoic Climate. GSA Today 14(3):4–10. Severinghaus, J. P., et al. 1998. Timing of Abrupt Climate Change at the End of the Younger Dryas Interval from Thermally Fractionated Gases in Polar Ice. Nature 391:141-146. Sissons, J. B. 1979. The Loch Lomond Stadial in the British Isles. Nature 280:199-203. Taylor, K. C. et al. 1997. The Holocene-Younger Dryas Transition Recorded at Summit, Greenland. Science 278:825-827. Shaviv, N., and J. Veizer. 2003. Celestial Driver of Phanerozoic Climate? GSA Today (July 2003): 4-10. Spurk, M., et al. 1998. Revisions and Extension of the Hohenheim Oak and Pine Chronologies: New Evidence About the Timing of the Younger Dryas/Preboreal transition. Radiocarbon 40:1107-1116. Veizer, J., Y. Godderis, and L. M. Francois. 2000. Evidence for Decoupling of Atmospheric CO2 and Global Climate During the Phanerozoic Eon. Nature 408:698-701. This page was last modified on 28 May 2015, at 20:59.